If Sunday night's episode ended with Priyanka Jagga being the first contestant to be eliminated from Season 10 of Colors TV's Bigg Boss, then Monday night's episode promises no let down in the drama inside the Bigg Boss house. A day after her elimination, the contestants will apparently wake up to find a huge cutout of Priyanka in the garden. Dos this mean that she will return? Meanwhile, the 'Indiawale' aka the non-celebrity contestants have greater problems than missing Priyanka: They make the mistake of discussing nominations among themselves, breaking one of the primary rules of Bigg Boss. They pay a heavy price for their slip-up: they lose their privileges as 'masters' of the house, and now have to serve the celebrities. Even as the other Indiawale are busy dividing up tasks and taking on their new responsibilities as 'sevaks', an argument is brewing between Swami Om and Rahul Dev. Seeing the celebrities sitting together and chatting during lunch, he keeps interrupting their conversations, until finally Rahul asks him to leave him alone. 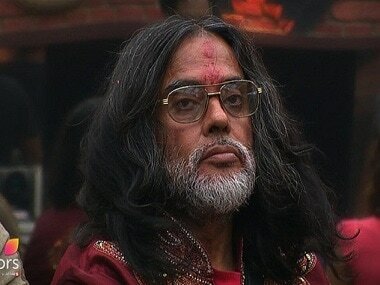 Swami Om complains about the celebrities' 'rudeness' to his other teammates. Meanwhile, there's dissent in the Indiawale ranks — Manu and Lokesh have a fight, over a cup of tea. Yes, you read that right. Manu apparently asks Lokesh to make him a cup of tea, and when she asks Akansha for help, this irritates Manu. He tells Akansha that he specifically asked Lokesh to make tea for him and she should have told him upfront that she will not be able to do it rather than delegating it to someone else. In her defense, Lokesh says that she asked for Akansha’s help because she wanted to have a bath before she could take up any kitchen responsibility. Among the celebrity contestants, there's some concern over the growing closeness between Mona and Manu. Karan cautions Mona against letting Manu get too close to her. When Mona discusses this with Manu, he tells her that she needs to make decisions for herself and not allow herself to be manipulated. Other highlights of the episode to be aired include an emotional breakdown from Swami Om (he claims he's missing Priyanka), arguments betwen Manveer, Swami and Navin, and an open nomination causes open confrontations between the contestants. Nominations tonight with a 'creamy' twist! Whew, and all this just on Day Eight! How will the contestants stay the course? And more importantly, which ones will?